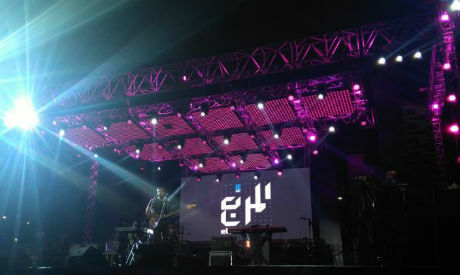 Early Friday, 22 September, a large crowd has gathered in front of Cairo Festival City's Music Park. Many young people arrived as early as 12pm, some coming from cities outside Cairo, to secure a place for the triple bill concert of Jordanian band El-Morabba3, Lebanon's Mashrou Leila and Egypt's Sharmoofers, taking to the stage that evening. Though Egypt has a large fan base for the three bands, it was hard not to notice a predominant following of Mashrou' Leila's fans, many of whom came wearing T-shirts with the band's name or logo, lyrics of the songs on them, in addition to bracelets, necklaces and even henna tattoos referencing the band. But there were also fans of Jordanian El-Morabba3 and Egyptian Sharmoofers showcasing their admiration for the bands and humming their songs. The concert started at 6pm (despite being scheduled at 4pm) and each band played for over an hour and a half, pushing the concert into the late hours. The evening opened with Jordanian band El-Morabba3 who performed their well known hits. 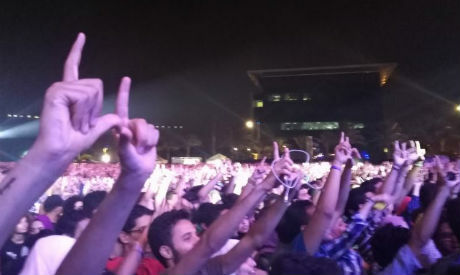 The crowd cheered the band members, creating the sign of the square with their hands in reference to the band's name in Arabic (El-Morabba3, meaning the square). Founded in 2009, El-Morabba3 consists of Muhammad Abdullah (bass, song writer, vocals), Odai Shawagfeh (electric guitar, keys/synthesiser, producer) and Dirar Shawagfeh (drums). On their Facebook page the band presents themselves as follows: "El Morabba3 to us is the window in which we see things we want to express ... being from a region that had seen a lot and still does every day. This window serves as our escape and our return all together." This is not El-Morabba3’s first concert in Egypt as the band has performed in several venues in Cairo and Alexandria, as well as participating in the Oshtoora Music and Arts Festival (2016) that took place in Fayoum. 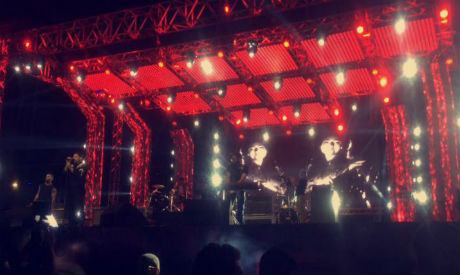 In August this year, the band was scheduled to perform in Dahab, but the event was cancelled. The second band to take the stage was Lebanese Mashrou' Leila (Overnight Project), a Lebanese alternative rock band that describes themselves as "born of a nocturnal encounter," formed in 2008 originally by seven members. Since their formation, the band has very fast reached the top of fame in the Arab region, extending their popularity to the international scene. Their songs fuse interesting and often metaphoric lyrics that touch on many issues embedded in Middle Eastern realities with strong rock definition and orchestration. 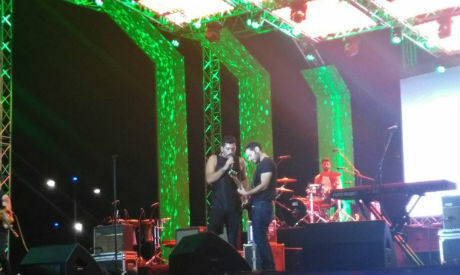 Mashrou' Leila's first concert in Egypt took place in 2011 when the band performed at El-Geneina Theatre during Al-Mawred Al-Thaqafy's (Culture Resource) summer programme. Since then, they visited Egypt on several occasions, making their Alexandria debut in 2013. Mashrou' Leila was welcomed with strong cheering from the crowd, proof that the band has a powerful fan base in Egypt. Listeners went almost ecstatic when vocalist Hamed Sinno opened the concert and continued to thrill attendees throughout the evening with his singing and dance moves. Some international reviewers compare Sinno to Freddie Mercury (or call him Freddie Mercury of the Arab World) for his unique eccentricism and musical talent. As the night continued Mashrou' Leila sang many of their well known hits, including Ala Babu, Aoede, Ashabi (Comrades), Bint El-Khandaq, Fasateen, Habibi, Lil Watan, Marikh, and 3 Minutes. Some audience members brought a variety of signs they waved in the audience or even aubergines on sticks, referencing Mashrou' Leila's song Raksit Leila (Night's Dance) where this vegetable is mentioned. Attendees jumped and sang to Mashrou' Leila’s songs, the atmosphere overtaking some girls who were crying emotionally. This lead to the song Djin with which the band wanted to close their concert, but the audience did not let them leave and the band performed two encores including their famed Shim El-Yasmine (Smell the Jasmine). After almost two hours on stage, Mashrou' Leila finally stepped down, to give way for the Egyptian band Sharmoofers. Founded in 2012 by vocalist Ahmed Bahaa and bassist Moe El-Arkan, Sharmoofers' lineup also includes Ahmed Aly (percussion), Mostafa Kerdani (drums), Mohamed Labib (saxophone), Islam "Solly" Ali (trumpet) and Adel Mohamed (percussion). Since its inception, Sharmoofers has entertained a large following with their music online and through live performances. In April 2014, they performed on the third season of El-Bernameg, the satirical show hosted by Bassem Youssef. 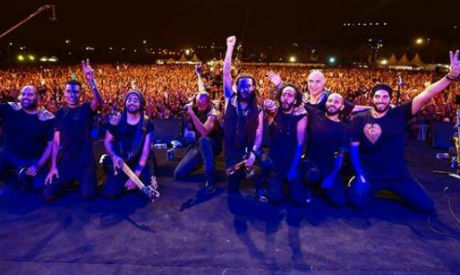 A month later, they made their debut live performance at Al-Azhar Park, and have since been performing in various venues across Egypt. By the time of Sharmoofers taking the stage, several audience members began leaving the concert location. 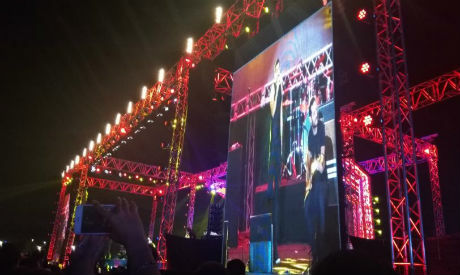 This was partially due to the number of Mashrou' Leila as well as ElMorabba3 fans coming for this unique opportunity to see their stars, but also by the time the Egyptian band took the stage, the late hour prompted the youngest listeners, particularly girls, to start heading home.